Migo had always been a lover, not a fighter, so this was really a change for him. It freaked his owner out. This current problem is really awful. It began mid-Nov 2012. Migo started attacking me with clawing swinging. I never got bit but I’m quick. He goes for the face if he can. Fortunately he announces these attacks with a peculiar meow so I’m warned. Many time he seems to be hallucinating, seeing things on the floors and walls like someone with the DTs. His eyes are wide and dilated. Johne, Migo’s owner, had consulted other vets who were at a loss as to what to do for Migo. They gave, wait for it… antibiotics! And they worked (!! ), though temporarily. The behavior stopped for a couple of months, but then returned. As Johne wouldn’t take antibiotics herself, and surmised that they weren’t going to cure Migo, she searched and found me. Migo presented as a 12 year old neutered male who probably had some Siamese in him. His mom was a “teen bride” feral cat, who showed up with four kittens under the barn, and was very tame. He’d been an indoor cat for the past two years, since coyotes attacked and killed his mom, and later his sister. When he was an outdoor youngster, he was vaccinated yearly for rabies and FVRCP, the usual combo wombo vaccination stew that cats get from conventional vets. Never mind that he was likely immune since the first round. The vets apparently also forgot that more vaccinations = more illness, but that’s common in the industry that is conventional vet medicine. Dr. WhiteCoat continues to promote this dangerous practice (Why? ), while the experts have urged the cessation of annual vaccinations for more than 20 years now. His haircut afforded a lot of relief from his itchy allergic state that set in seven years earlier (likely as a result of all those vaccinations). He was allergic to dust, fleas, turkey and corn. We’ve known for many years that repeatedly vaccinating for an illness brings the animal into a chronic state of that illness, with symptoms often presenting in a similar form. Those symptoms commonly reside in the organ that the natural disease would affect. This was first observed in veterinary medicine by my homeopathy teacher, Dr. Richard Pitcairn. If you want to explore this further, it’s presented here. It’s highly recommended for your understanding of what vaccinations are capable of. So, consider if you will, the disease of rabies. It’s organ of residence is the brain, and the rabies virus spreads by changing the behavior of the infected animal significantly: it makes him aggressive. The rabies virus is spread through saliva, and the part of the brain affected by rabies controls behavior. When infected, the animal loses it’s natural social tendencies, and will now bite others. Boom, the virus can spread. While that in itself is quite remarkable, it may also explain a good deal of animal aggression. A significant reason cited for owners turning pets in for euthanasia is aggression to other animals or people. Is it too much of a stretch to imagine that repeatedly vaccinating with rabies virus, a virus responsible for aggression, might well confer aggression in the vaccinate? I think it’s not. A term coined by J. Compton Burnett, a British physician of the late 1800’s, vaccinosis is illness that results from being vaccinated. We see it frequently in veterinary medicine, as long as our eyes are open, often appearing 3-4 weeks post-vaccination. It can show up much later, and in the case of rabies vaccinosis, we get suspicious when we see behavior changes, especially towards aggression. Migo was described by Johne as “the sweetest cat ever.” She could hold him over her shoulder, he often lay with all four legs in the air, he’d follow Johne around the house, and was quite a talker. And then, things changed. He started “talking” more. He’d stare at places, as if watching something, and Johne couldn’t see anything there. And then, he began attacking her, typically at night, even in her sleep. This behavior was unheard of for him before, and he’d get a strange voice to indicate he was coming for her, eyes fully dilated. At times, Johne saw his head move involuntarily, side to side, and once felt his body tremble as she held him. My first analysis brought up the remedy phosphorus quite strongly. It matched his apparent perception changes, trembling, wild behavior, and it was one of the rabies remedies. Phosphorus patients liked company, but weren’t particularly known for being ameliorated by being carried. I sent Migo a single dose of phosphorus 10M. He took it March 9th of this year. The report two weeks later was that Migo mellowed, beginning on day five, and had nine “like his old self” days. But then it started again. Aggressive to his doting owner, attacking her and scratching her hand. Damn. New information coming in our follow up appointment revealed that now, Migo’s aggression was only in the evening. It used to be at various times, but now, it began an hour after darkness, with the strange meow and dilated pupils. He’d stalk Johne, and she either would stand over him shouting loudly or she’d carry him. Both helped shift his behavior. Once, having had enough, Johne isolated Migo in the bedroom and slept on the couch for the night. He was upset! He called her, wanting her company! I determined phosphorus was close, but it was time to find a better remedy. Hallucinogenic Herb to the Rescue! I re-analyzed after our second conversation, emphasizing this newly found modality: he was worse when it was dark, no question. He was violent, and his owner’s company ameliorated him. Odd, isn’t it? You might imagine an aggressive animal to be instead quite isolated, too irritable to be held, or worse when ever he was around his person. Not Migo. The remedy stramonium, made from datura or Jimson weed, a known hallucinogenic herb that interestingly, blooms at night, came up strongly. In homeopathic form, it’s diluted beyond any risk of intoxication, and I gave a single 10M dose. Migo is doing so well! I think you must have found the key to his problem. At this time he seems perfectly normal and back to his old self. It was so similar to his illness that a tiny dose set him up to cure his rabies state. No repeat needed, and no side effects like drugs would have. Cool, right? And once more, I’m out of work: “I’d like to cancel our call on Apr 23rd @ 10:00.” But that’s my job: cure and be unnecessary after a while. It’s all good. Wow, mind-blowing story. And brilliant assessment and remedy! Indeed it wasn’t Migo’s fault, Stephanie. We’ll lay the blame where it belongs: too many unnecessary vaccinations for a disease he’d been immune to since he was a youngster. Sir, thank you for sharing this story. 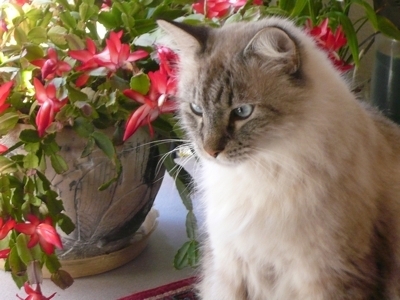 I have a question: is there a way to vaccinate my adopted cat of 2 years using homeopathy? He has already received 1 shot when he was a kitten; now vet says he needs another one. My male cat Jorgy, would do some of the same things that Migo did. Our vet told us that he was stressed out and had us use a plug in that was to calm him. This did not work at all. He was running up our walls and then flying at our heads crying the hole time. This went on for about a year and then he just stopped. I dent know what to think, I was just glad that may baby was back. Sounds more like he was having anxiety attacks. If they should return, seek out a vet homeopath by searching the AVH listing on my Resources page. Homeopathy can cure these behavioral diseases, while drugs cannot. Great that you could isolate the SRP that Migo’s aggression was only in the evening which led you to the correct remedy. Good work Doc! Thanks Sandra. The other interesting bit to me was how put out he was when he was forcibly given a “time out” from his guardian! Desperately wanted her company, yet would attack her!! Perhaps then the fact that Milo desperately wanted her company but then would attack her was the SRP symptom that pinpointed the remedy? Yes, that was more peculiar to me than the evening aggravation. Why would an animal who was aggressively attacking someone also feel so needful of loving attention from that person? That duality was the nub of choosing stramonium for him. The stramonium patient is described in the materia medica as having “ceaseless talking…can’t bear solitude or darkness, must have light and company.” They also “see ghosts,” and Migo would stare off at something intently that Johne could never see. Beautiful! I’m so glad to have read this cat’s story. Nothing warms my heart like an animal helped by homeopathy. Just reading through this older blog post…. simply amazing, and the reason homeopathy is indeed the only real medicine because it can cure! Wow, this has to be the stuff that keeps all of us believing in the miracles of homeopathy. Linda you’ve come to the right place! hi. i am Lori, am a friend of alkaline lifestyle. i work alot. i need a short amout of time to discuss sugestions. much appreciate this web site and love a good mission. Hey $%#&*^- we require shots because I DON’T WANT TO GET RABIES NOR POSSIBLY INFECT ANY OTHER OF MY CLIENTS DOGS. This is a brilliant example of the confusion around this disease called rabies. You don’t want to get rabies? Understandable. Are you seeing much around you? It’s a reportable disease, you know. Your state public health website and the CDC report every case in wildlife and domestic animals and people. My bet: your entire state might have had two cases in the last year, in skunk or raccoon. Any idea how it spreads? Your “clients dogs” would have to be bitten by a rabid dog. Ever see one? You’d know if you did. Dr Falconer! I can’t tell you how grateful i am for this story about Migo! You have seen my cat Harley in Austin. Last year we went to Ecuador and the only vaccine I couldn’t get out of for him was the rabies. Sure enough…he has turned aggressive… it has gotten progressively worse and i need help. His eyes dilate, his whiskers puff out and he lunges at me. He snaps in and out of it in an instant. I am really hoping you can help! Oh, Joy, I’m so sorry to hear this. Likely I can help, but it’ll take some appointments. Just drop me an email and we’ll figure out a time to get started.